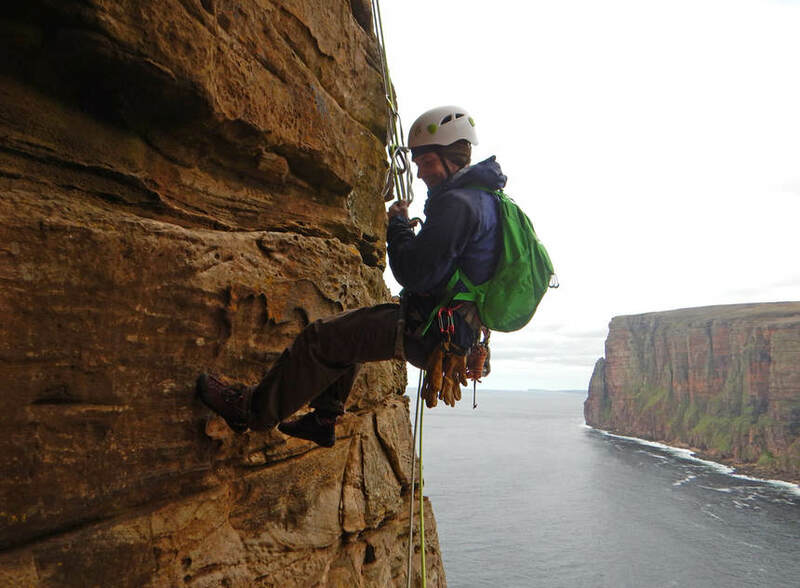 Alison McLure of the Institute of Physics will speak on The Physics of Mountain Rescue in this year’s Orkney International Science Festival. 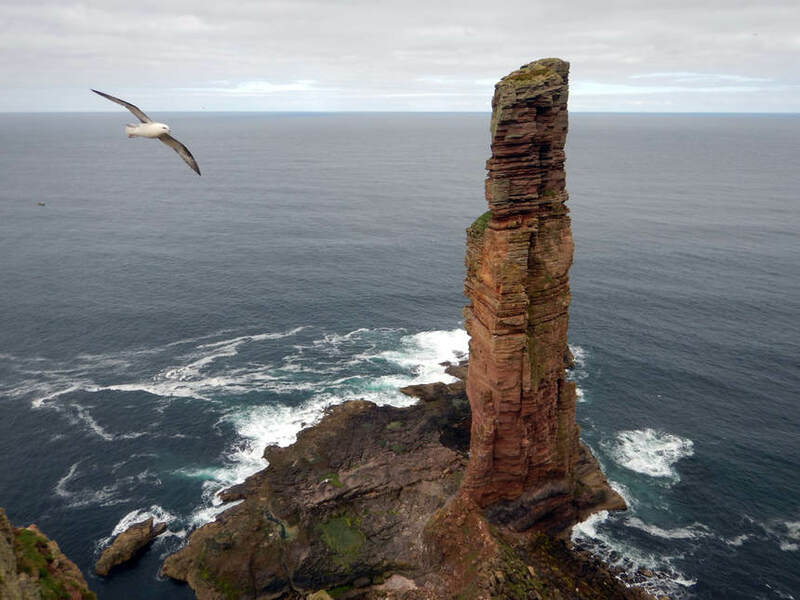 She recently climbed the Old Man of Hoy with a group led by Mike Pescod from Fort William, as part of an expedition to a number of the northern sea stacks. Here is his account of the climb, along with some of his photographs. Think about the numbers; there are 10 million people living inside the M25, an area about the same size as the Isle of Skye on the West Coast of Scotland. In all of Scotland there are only 5.5 million people and 3.5 million of these people live in the central belt. Around the coast of the far north of Scotland you are in for a rare treat. Endless sea cliffs with amazing rock in a wild landscape and with nobody else around for miles in any direction offering as much adventure as you’ll ever need. And then there’s the sea stacks to make it even more fun! Ella, Dave and I went on a road trip along with Donald, Cathy and Alison to find the best sea stacks and sea cliff climbing on offer. For a warm up and shake down day to get attuned to the noise, the feel and the smell of sea cliffs we went to Sarclet close to Wick. On the East Coast just south of John O’Groats the weather is pretty reliable and the rock is solid. Sarclet Pimpernel and Groove Armada require an abseil down to a small ledge and hanging belay just above the waves then amazing moves on solid rock back up. Only one dropped belay plate and one delicate dangle in the sea made it a successful day. We were ready for the first old man of the trip, the biggest old man in the country. If you have to take a boat it’s going to be a good climb. 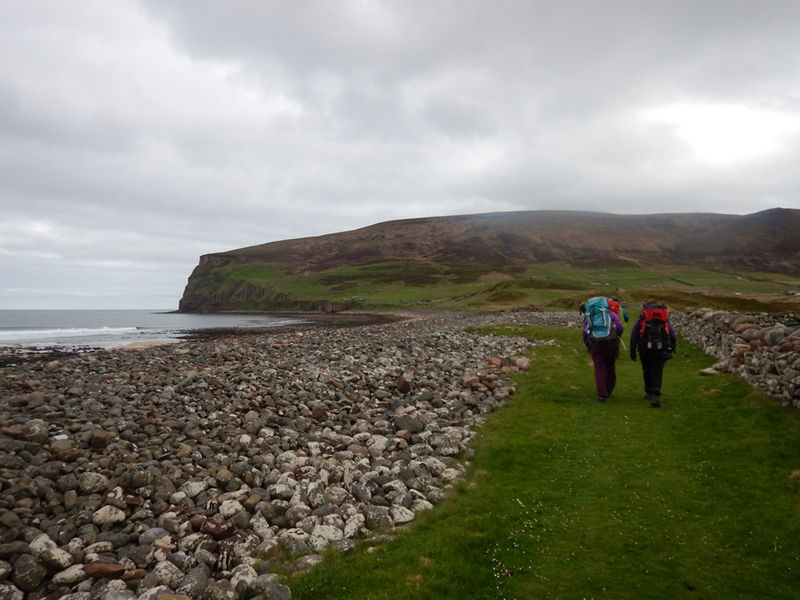 We had to take two boats and a taxi to get to Rackwick bothy on Hoy, a small but welcome building made of the sandstone we hoped to climb, a building that seems to grow out of and be part of the boulder beach. The swell on the sea and the heavy rain were not quite what we wanted though. 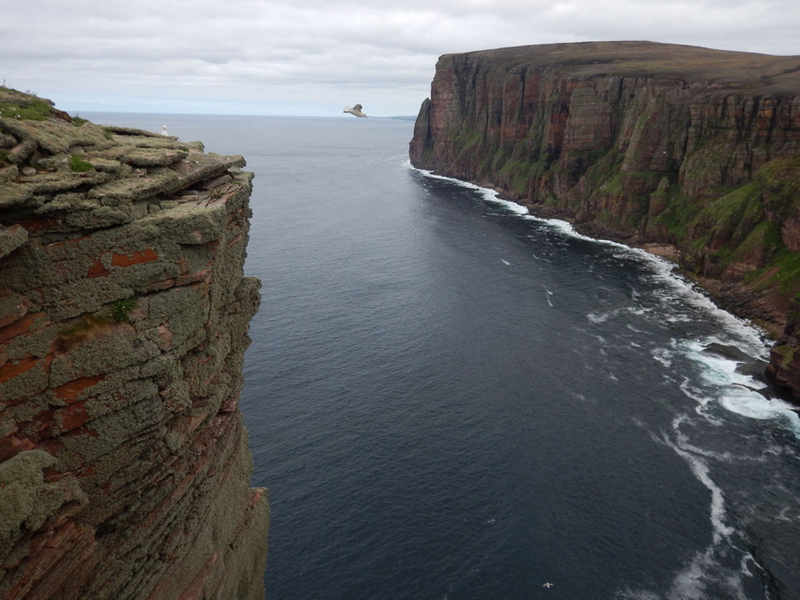 The scale of the cliffs around the bay and crashing waves made it a very atmospheric place. Even the boulders on the beach are huge, like massive dinosaur eggs. It seemed that surfing might have been a better choice than rock climbing. The next day was bright and breezy though and the rock dried out quickly. 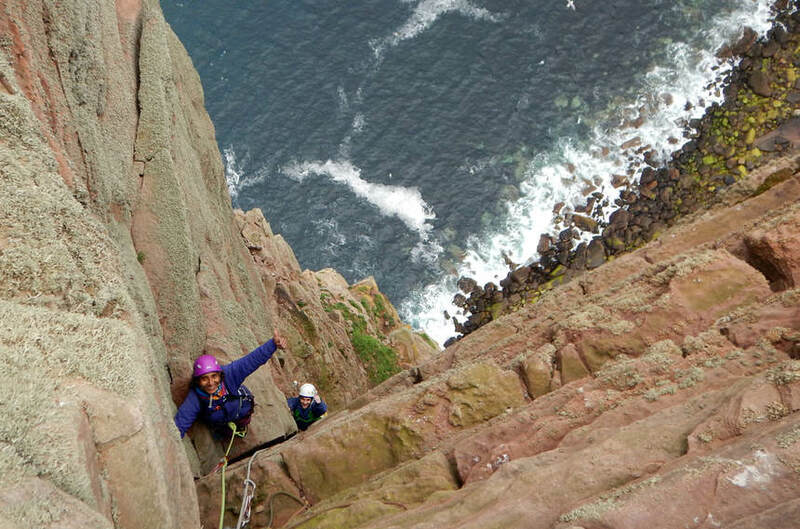 The crux corner of the Old Man of Hoy provides typically three-dimensional climbing with more pushing than pulling. Training at the climbing wall will not prepare you for this pitch, especially the 50-metre drop straight down to the boulders below. From Mike Pescod’s blog on the Abacus Mountain guides website. Alison McLure will speak on The Physics of Mountain Rescue on Tuesday 11 September in the King Street Halls, Kirkwall, at 11.30 am. Mike Pescod has been instructing mountaineering and mountain guiding in Britain and abroad since 1993. He has lived in Fort William, on the west coast of Scotland, since 1995 where he has climbed extensively and put up new routes in summer and winter. Scottish winter climbing and Alpinism are his strengths and he has made very successful expeditions to the Caucasus, Tadjikistan, Peru and East Africa.